Bergamot Apartment is a classy home in the center. This bright apartment is waiting for you with its airy spaces, bathroom and kitchen, fitted with all utensils and cutlery; you can even have guests for dinner. Cable TV, WiFi, washing machine, iron… are all at your service. Bergamot Apartment is situated between the main places Oktogon and Nyugati railway station. The old facade of this building hides a very modern and stylishly furnished flat on the 4th floor. This bright apartment is waiting for you with airy spaces, bathroom and kitchen, fitted with all utensils and cutlery; you can even have guests for dinner. Cable TV, WiFi, washing machine, iron… are all at your service. 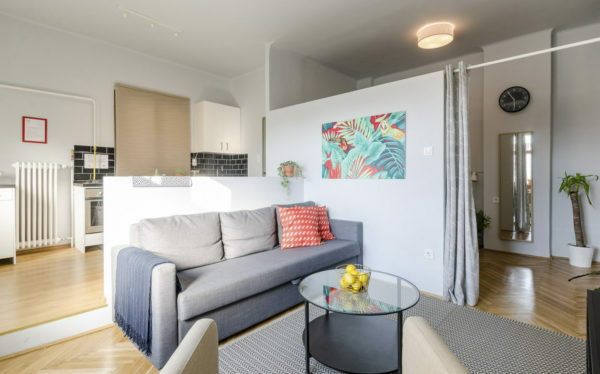 Situated in a very central position, this apartment offers great pleasure for those who wish to soak up the unique vibe of Budapest’s inner city. May it be cultural or historical interest, classical or modern music, movies, theaters, tea houses, night clubs… you decide whether it’s a high-class or a more casual atmosphere that suits you best. You could take a walk down the pedestrian-only areas such as the Danube Embankment or Vaci utca. The Zoo and Botanical Garden, thermal baths, the majestic Buda Castle, Parliament, Gellert Hill, Margaret Island, City Park and the world famous Chain Bridge are all within walking distance. Alternatively, public transport will offer you excellent access to all of Budapest’s top sites: subway lines, tram and bus lines – are just a five minutes walk away.